Our challenge this week was to tangle on something we wouldn’t normally use. It just so happened that last week I picked up this leaf from outside my office. It just sort of struck me … “hmmm I’m going to tangle on this”. I brought it home, but forgot about it for a couple days. When I decided to use it, I found it had gotten pretty crispy so I sprayed it with some water and then ironed it flat! With all the veins, it was kind of difficult to tangle on, patterns are a bit messy, but it really was fun to try something different. Going to grab a few more and see how they turn out. See all the other creative ideas on the Diva’s site. Wauw, great idea . 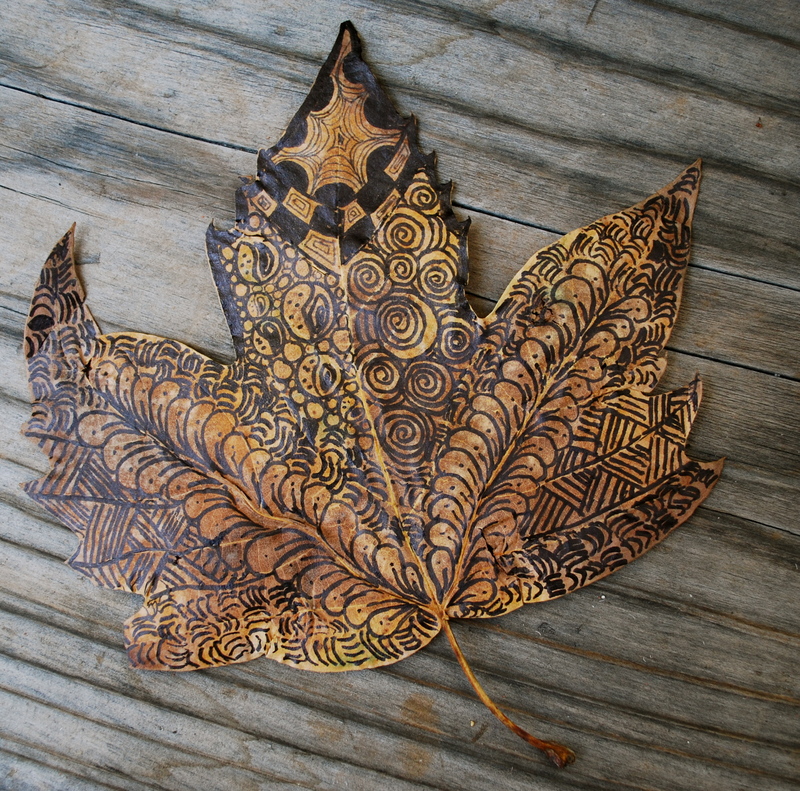 Beautiful leaf. This is such a wonderful idea. I can just picture you ironing your leaves LOL! Lovely! It’s lovely and there will be plenty of these about for the next few weeks. I particularly like the way you have used Flux up the veins of the leaves. nice work and great idea. Lovely! I love your black ink. The contrast is beautiful! I did leaves, too, but not nearly as striking! It turned out beautifully! Great choice. This turned out so beautiful and is a great idea. This turned out beautiful! Nice idea. This is so lovely! I assume it is not easy to tangle on a leaf. Great! What a wonderful idea, I would never have thought of ironing it first lol. It has come out really well, another for me to try and it will cost nothing. I can only echo – beautiful – I love it. Pretty! right on a leaf…love it! What a beautiful idea, and beautifully done! This is beautiful! The extra bit of black at the tip really makes it pop!